Grab a case of this affordable 9mm Luger ammunition from Federal for all your range needs. These cartridges fire a light 115 grain full metal jacket bullet and deliver good accuracy at pistol ranges. 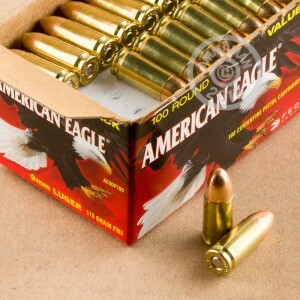 This ammunition comes in a bulk case of 500, divided into five boxes of 100 rounds each. Each round uses non-corrosive Boxer primers and brass cases. Snag this great deal from AmmoMan.com and get another bonus if your order total exceeds $99--free shipping and handling! Could not be more impressed!! First time customer. Places order on a Sunday afternoon, and order was at my door on Tuesday, you can ask for anything better than that. Ordered 500 9mm, and 500 5.56. Shot up 250 of the 9mm on Saturday, zero malfunctions. Grouping was consistent throughout the day from 15 to 50 yards. Will buy this again and again, but next time it be a 1000, 500 won't last long. 5.56 review next weekend. 300 rounds through my Shield and no jams and only one failure to load. It is all about price/performance and this ammo is some of the best for range and practice. Fast Delivery recieved in 2 day's. Great deal. Ammoman is my New go to Guy. I was really pleased with the product. As good as I expected. 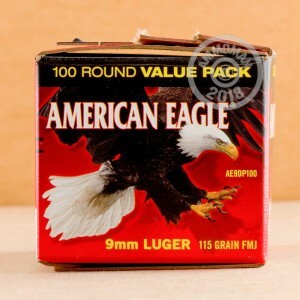 I give the American eagle luger 9mm ammo 5 stars. Great ammo for the range. I have several 9mm pistols and one of them has some issues with various 9mm brands even after various "fixes" like a new recoil spring, major cleaning, and a new extractor. However, It performs flawlessly with the American Eagle 9mm ammo. Ammoman was a hunch. They came through big time! Ordered and received in 3 days. I am impressed! You can't really ask for better target rounds. Reliable, cost effective, and American made ammunition. Great accuracy, as well. No malfunctions of any kind over many years of shooting. Fast shipping (3 days.) Great deal, Great company. Good ammo and it got here fast. The service was excellent and the price on the ammo was great. My wife and I are enjoying shooting together. Excellent product. Like buying from ammo man free shipping and fast delievery. Excellent for the range, it's consistent and never not works. Great ammo. Great product and customer service smoked it!! I would buy the same again. Great price and no issues with the ammo. Would definitely buy again. This is my go to ammo. Never a problem, and never hesitate to buy extra when it's on sale. Good brand and boxed to easly take to the range. I am constantly looking for major brand ammo to use in my 9mm Ruger. I like the Federal because it comes in 100 round boxes, which makes it easy to grab a box or two to take to the range. I will purchase again. Excellent. Not one FTE or FTL. I will definitely be buying more. Service was great. Product arrived quickly and on time. Had absolutely no issues with any of the rounds fired, not exceptionally dirty rounds like many of the other lower cost options. Quality brass cased round for general shooting/practice. This site was easy to order from and delivery was fast. I will definitely order from this site again! Well known quality 9mm at a great price. Will be back for more. 500 rounds through a new Beretta PX4 Storm 9mm full size. No issues. Gun still looks clean. Loved the ammo. So far have put 400 of the 500 rounds through my Walther PPQ M2 without a single misfire. Would definitely recommend! Will order more when it goes on sale again. Used this ammo in my XDM 9 mm and it was excellent! Haven't had a single issue. The shipping was really fast. I ordered on a Wednesday night and it was on my doorstep Saturday morning. Have not had an issue using these rounds. The ammo is as described , good price. The delivery time could be better. Good deal! Cycles through my glock very nicely, good prices fast shipping! Definitely telling my friends. Ordered the product on a Sunday (non-business day) arrived on a Tuesday .. .basically 1 business day. - hard to beat. Boxes and ammo looked fresh ... not beat up. Great price. Fired 100 rounds through my new SCCY CPX-2 without a single failure to feed, fire, or eject. I bought this ammo due to the higher velocity compared to other brand factory ball ammo. I needed the high velocity to work with my compensated Glock 17 Gen4. This ammo works great with my KKM Precision barrel and threaded KKM 2-port compensator, using a 13lb Gen3 recoil spring with stainless steel guiderod. I will order more of this ammo soon. Order came very quick and was exactly as advertised. Only down it was just left on front door step with nobody home , not your fault. Not that I was blown away by prompt service, great pricing and great selection! The rounds perform as expected every time and I'm through several thousand in the VP9. Work flawlessly, Shipping was fast. Work flawlessly, Shipping was fast. I've gone through hundreds of rounds of these and have had zero issues. The ammo works great; just as expected. The ammo works great; just as expected. The only problem is that my new Glock 26 Gen4 ejects the spent rounds onto my hat, or close to my face. This ammo worked well for its intended purpose; range/target practice. No duds or jams. This ammo fired flawlessly from several different handguns. Great value for the money. Couldn't be happier. Competitive price, and the delivery was within three business days. These deal was cheaper to buy it around my area even cheaper than the Winchester White box. I will recommend this offer to anybody. Can't wait til I hit the range and demolish some target with 500 rounds. Great products, great prices, awesome service. I couldn't ask for better. This is the way to run a company!! Fast delivery and all rounds fired fine, no missfires. good price, delivery and product. Rounds performed flawlessly with absolutely no failures. Very consistent. Great value. Worked well with no issues and the shipping was perfect. I think it is an all round great product. Best ammo for my Glock...it likes it and at a price that you can't beat on any web site or store. Shipping is very fast. If product matches service..... 5 stars plus!! Still have about 150 rnds. from previous order (Magtech) which were superb. I have NO doubt that these Federal will do just as well...... you guys OBVIOUSLY know that great service/products is a win/win! Thanks! Overall a good quality purchase & I'm very satisfied. I received the ammo as promised in a timely manner. The ammo was very good quality as advertised. the felt that the price was competitive for my area. Ordered the product on Saturday and it was at my door on Wednesday. Had just purchased a new Sig, so I took it to the range with 100 rounds of this ammo and some others. I put this stuff through the gun first...No issues.